The Tibesti Mountains south of the regional capital of Bardaï. Photograph by Michael Kerling. In this part of ”Off the beaten track” we will well and truly go off the beaten track, or perhaps we are getting to one of the most beaten tracks on the planet. You will have to be the judges of that. In this part volcanism takes on a scale of grandeur on an unprecedented scale. But, before we get going I will once again have to take issue with Wikipedia and its exhortations about the touristic prowess of out of reach places like this. Whatever the fevered minds writing Wikipedia articles may believe, the Tibesti Mountains is not a tourist site. As you will notice in the article, this is one of the most dangerous spots on the planet. Since 1957 about 100 non-military westerners have entered the Tibesti Mountains, a few of them have come out to tell the tale, but far from everyone. Oh, and speaking about armies: The French army gave up, The Italian army gave up, The Libyan army gave up, The Carthaginian army gave up, The Roman army gave up, The Ottoman army gave up and so did the Chadian army. Ya’ll get the picture now? Well preserved Rock Art depicting giraffes from a period when the Tibesti was more lush. Photograph by Rudolph Baumann. Nobody knows how long the Tibesti Mountains have been populated, but we do know that there has been humans living there for at least 6 000 years. That is the known age of the oldest rock carvings found. There are at least 200 rock carvings in the area. There are probably a lot more known to the locals, but they are not telling about them. 2 500 years ago new tribes started to move into the Mountains of Tibesti and together with tribes already living there they formed the Toubou people. Toubou in the local tongue means “People of the Mountains” and Tibesti means “Mountains of the People”. For them the Tibesti Mountains filled three purposes, first of all it was an impenetrable mountain fortress of prodigious size, secondly it held water and was arable for farming and thirdly it was an ideal spot for caravans to make a pit stop. If you wish to cross Sahara with a caravan there was basically three different routes you could take, either the Atlas/Hoggar route to the East, the Haruj/Waw an Namus/Tibesti central route, or the Nile route. Due to the scale of the Sahara you have to take the closest route, traipsing around to go another way is just not economically viable. Trust me on this, I have walked across Sahara and I can testify that it is a pretty big place. Being the pivotal point of a trade route more important than the Silk Road transformed the Toubou into a rich high culture for an extended period of time as they themselves traded, or taxed caravans from other people. The trade started with the Carthaginians and continued with the Romans when they had finished salting the grounds of Cartago. The Romans just looked at the Tibesti Mountains and decided that enough was enough and that the Empire could not grow further in that direction. After them came the Touareg, the Venetians and Arabic merchants. By now the Toubou had happily defended and profited on caravans for 2 000 years, but here on it takes a turn for the worse and for the Toubou the last 500 years has turned into a long and bloody series of wars almost totally destroying the once rich mountain Kingdom. Land Art by Jean Vérame at the Tibesti. I do think he survived, well at least his camera made it out. Photograph by Jean Vérame. It all started with the Ottoman Empire and its fervent wish to control all trade in the world, or just conquering wherever they went. At the time the Ottoman Empire was the most powerful superpower on the planet and rapidly their armies got pitted against the stubbornly independent Toubou. During a span of 400 years the Toubou fought, tried to negotiate and tried to trade with the Ottomans. But, whatever they did the onslaught was relentless until in 1780 a large Ottoman Army entered the Tibesti Mountains slaughtering 60 percent of all the Toubou. It speaks volumes that not even that made the Toubou give up. Instead the Ottoman Empire felt that it was just not worth it and started making agreements instead with the Toubou. After that the Italians came from Tunisia and the French from the South and the Toubou bought arms from the crumbling Ottoman Empire, they even invited the Ottoman Army to build a field post in the mountains. But, that field post quickly crumbled and the Toubou in the end attacked the post and took their weapons. The Toubou was in the end to much for the Italians, but the French overran the Toubou in turn. But, the French decided that it was just too much hassle to actually hold the Tibesti Mountain so they signed a treaty with the locally elected King making the entire place into an autonomous region. In 1960 Chad got independence and the Toubou kept the new Chadian army out while maintaining fairly good contacts with the remaining French giving the area a five year long peace. After that both the Chad Civil War breaks out and the President of Chad signed over a large part of the Tibesti Mountains to Muammar Qaddafi. The details here are just too much to go over here, but in the end two leaders emerged from the Toubou, one who took over Chad and another that fought the Libyan army. In the end the Chadian Toubou leader sent the Chadian army to help beat the Libyans and in March 1987 the war was finally over, at least for now. Today the Tibesti Mountains is a highly independent autonomous region of Chad and on somewhat good terms with the Chadian government. But, the wars have left the Toubou a splinter of their former power. By now there are 8 000 Toubou living in an area the size of Iceland that is littered with tens of thousands of landmines and unexploded artillery shells that are still claiming lives. The 500 year long experience with foreigners trying to occupy them has left the Toubou rather suspicious of foreigners, and who can blame them for that? Composite Satellite Image from NASA Worldwind. The area is the size of Iceland, so satellite imagery is the only way to capture things. Thin yellow line is the boarder between Chad and Libya. By now almost no trade is hauled via the old caravan routes leaving the Toubou a very poor people. Still, they do have the possibility to have a very rich future from the very ground they live upon. The mantle upwelling have carried up vast amounts of minerals from the craton it punched through. The Tibesti Mountains contains deposits of Uranium ore, Tin ore, Copper ore, Gold ore, Silver ore, Rare Earth Minerals and both diamonds and emeralds. But these riches is a twin edged sword, the reason the Libyans attacked them was to gain hold of the Uranium ore and there is quite a risk that some country will try to do the same again. The ore bodies are concentrated both among geothermal wells that have concentrated the minerals and among kimberlitic pipes from a more explosive phase of volcanism. In many ways the Toubou is living on top of one of the richest spots on Earth, I just hope that they will survive to see those riches themselves. For now their ferociousness and the weakness of the surrounding countries protect them, but in the end the Toubou will have to pick a strong partner to help them to develop the ore bodies by themselves, or it will be taken from them. The definition of big volcanism. A corner of the worlds largest continental volcano, I will return to it in the next instalment. Photo by NASA/JPL taken from the ISS. This region of Africa should be a highly stable part, and for a very long time geologically speaking it was. It consists of cratons and welded cratonic platelets with an age spanning between 2 billion years and 500 million years, as such it is not a part that should all of a sudden start to break apart. The reasons for the current passive rifting and the mantle upwellings are four momentous events in Earths geological history. The first one was one was when Pangaea rifted apart 175 million years ago and North America was torn away from North Western part of today’s Sahara. This left a mantle upwelling that over time turned into the Canary Island hotspot and the failed rift running from the Atlas Mountains of Morocco to the Canary Islands. The next event happened as the minor super-continent of Gondwana broke up 140 to 120 million years ago and Africa rifted apart from South America. This created a major and stable mantle upwelling that is active up until today that is known as the Cameroon Volcanic Line. South America almost tore away the North West part of the African continent, but ultimately that rift failed. The part that is directly to the North west of the Cameroon Volcanic Line remained active as a Passive Rift. These two events left this part of Africa like a cracked egg with the pieces still attached. All that was needed for this part of Africa to come unhinged was a final hit from a new direction. The third event that happened was when Africa plowed into Europe with a speed of 2.15cm per year about 40 million years ago. For the next ten million years the African Plate seabed subducted in under Europe until the thicker parts of the continents hit each other and the subduction stopped. This created the famous subduction volcanism at Etna and a series of mantle upwellings started that created a series of magmatic domes under Sahara. In the last article we discussed the effects of the Libyan doming, in this article we will discuss the doming in the Tibesti Mountains in Chad and we will return to other domes that are still active in later articles. These mantle upwelling domes have in common that they originate at a depth that ranges between 80 and 150 kilometers. They also occur along two major geologic formations, either the Cameroon-Etna Volcanic Line, or the Tibesti Passive Rift spanning from the Atlas Mountains in Morocco to beyond the Great African Rift in Somalia. As we learned in the last article the Cameroon-Etna Volcanic Line traversed a northern local passive rift creating triple junction volcanism at Al Haruj. Today we have come to the point where the two major geological features intersect at the Tibesti Mountains creating one of the world’s largest triple junction volcanic centers. Now, if things had stopped here the passive rifts would have transformed into active rifts by now propelled by the magmatic upwellings, but this did not happen. Something that some people interpret such as that the African Plate will survive breakup. For 28 million years Africa shoveled poor Europe in a NNE direction without mercy, but over time Europe ran into resistance in the far North and strain started to build up. And two million years ago a proto-subduction zone started to form near Etna, a process that is still ongoing. This time it is not Africa going under Europe; instead it is Eastern Europe that will go in under Eastern Africa. Now, guess where the line goes between subduction and no subduction? You guessed right, Italy and the countries to the east will end up sliding in under the African Plate to the East of the Cameroon-Etna line lifting this part of Africa like it was on hinges. This will of course remake the Cameroon-Etna line into an active rift. Here we are left with two options, the entire Northwestern part of Africa is torn away as a whole part along that newly born active rift, or the part northwestern of the passively rifting Tibesti line rifts apart and the area south of that line slides out into the Atlantic. So far GPS-modeling seems to favour that this part of Africa divides into several smaller areas. One part will remain that is west of the Great African Rift system containing mainly south and southwestern parts of Africa, The Somali Plate rifts away, The Northwestern Sahara ends up as a craton-terrane of Europe and the part between the western Tibesti line and Cameroon Volcanic Line drift off into the Atlantic in a generally Northwestern direction. Oh, I forgot… There will be another part between the Great African Rift and the Eastern African Rift. Many small Africa’s to love indeed. In the next part we will go into the volcanism in Tibesti and its volcanoes. The article would otherwise have taken far too long to load. Wonderful introduction Carl! I cannot wait until the next installment. Than you! This series is hard to write about. The more I poke about the more places I find that nobody has researched well. Epicenter about 30 miles from Marsili. I noticed that this near M6 quake just hit the western coast of Italy two days before today´s M6.9 earthquake. Perhaps a link? That’s either a typo or hella deep. Inside of a subducting slab as it hits the transition zone? Can’t wait for the next instalment. It is a well-hidden region, inaccessible even though Chad is quite well governed. One comment: continents subduct very reluctantly. Oceanic plates subduct (if not too young and warm) but continents float. Africa and Eastern Europe colliding is more likely to form a new mountain range than a subduction zone. That is a detail though. I believe it’s even more complex than that as most continental cratons are made up of three or more layers with an omnipresent(?) layer of oceanic crust at the bottom which quite likely shears off to subduct as the top layers collide and tower thus pressing down the bottom-most part of the craton by their combined sheer weight. The band of volcanism stretching from Central Turkey through the Caucasus would seem to argue that this is so. Have you really walked through the Sahara Desert? How old were you, and who were you with? It´s a great super great article Carl! I love this off-beaten track series…. it makes me dream to travel on these spots, despite the risks! I did it during my army days testing survival techniques and equipment. But, mainly due to my love of deserts. I did it in two stages. Morocco to Tunisia and a year later Tunisia to Egypt. In the end I walked 6000 kilometer in 150 days total. I am still gunning for doing a similar trek across the Namib desert if I can get the permits needed. There has been a 6.5 mg earthquake Italy this has been widely felt . M6.6 and extremely shallow, reported at only 1 km depth. It is terrible and you feel for all the people affected. I think this may be the strongest earthquake to hit Italy since the 1980 quake in Naples. The damage must be extensive. Hopefully this will be the last one in this sequence (but expect aftershocks which could also reach M5.5-M6). Is not this the third earthquake over M6 it may be a silly questions but could these be the prelude to an even bigger quake if pressure is still building ? Historically, this region has experienced earthquake sequences peaking at M6.5-M7 every 500 year or so. So a bigger earthquake within tens of kilometers is possible but less likely. Gianluca Valensise, a seismologist at Italy’s National Institute for Geophysics and Vulcanology, told Reuters there was a “geodynamic link” between the deadly August earthquake and all those that have followed. This is a very stark warning to the authorities in the vicinity. Houses must be shored up and any house not able to withstand a M7 earthquake must either be shored up, rebuilt or torn down, since they will be at risk for collapse in the near future. The maximum magnitude is limited by the lenght of the fault. I dont know how long are the faults in central Italy. Then, as in Iceland SISZ, M6 earthquakes can come in sequence, within a few days, several major quakes in adjacent faults, as one fault triggers the next. So, I think another M6-6.5 quake is likely, but a larger quake is probably not possible, as M7 is probably the limit that faults in Italy can create. 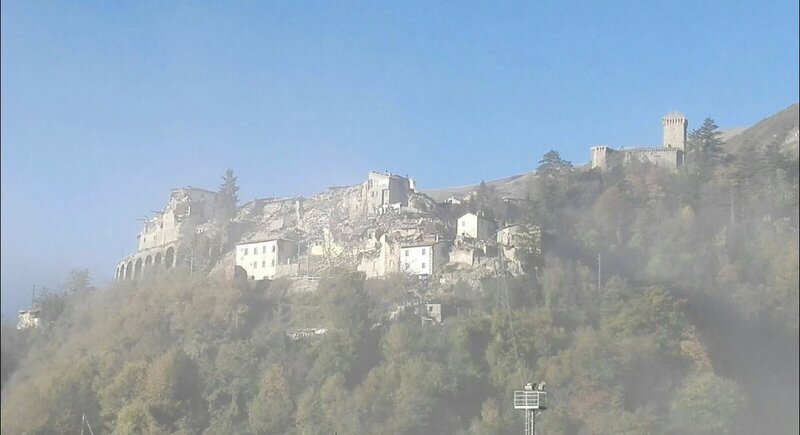 Norcia has experienced several M6.5 quakes over the past 1000 years.
.@FerdiGiugliano about 0.75g largest horizontal ever recorded in the country. Previous record was L’Aquila 2009 about 0.65g. Interesting Luís, but what does it mean? So sad to see this damage.